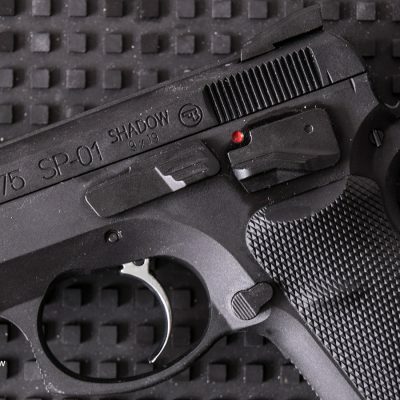 The CZ 75 has gone through many different alterations over the years. 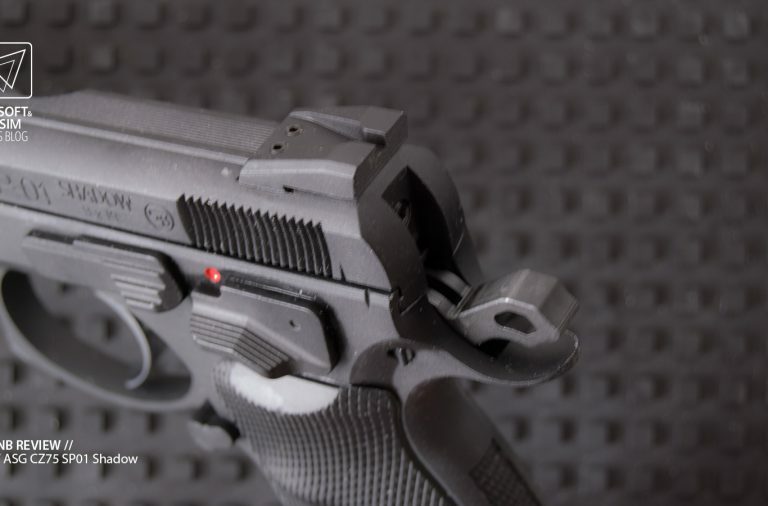 Whether it’s for law enforcement, military or competition standards, a variation of the CZ 75 has been made available for each industry and more. 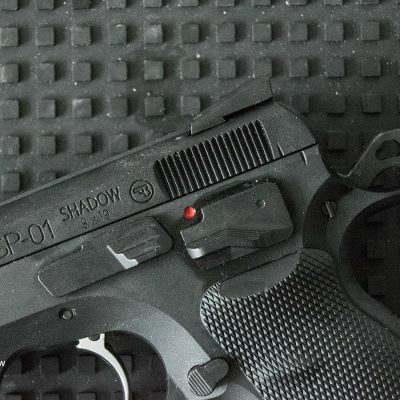 The SP01 Shadow is an exception to this rule as it has been adapted according to law enforcement, military and competition communities. Most specifically by the Team CZ world premiere shooters Angus Hobdell and Adam Tyc. 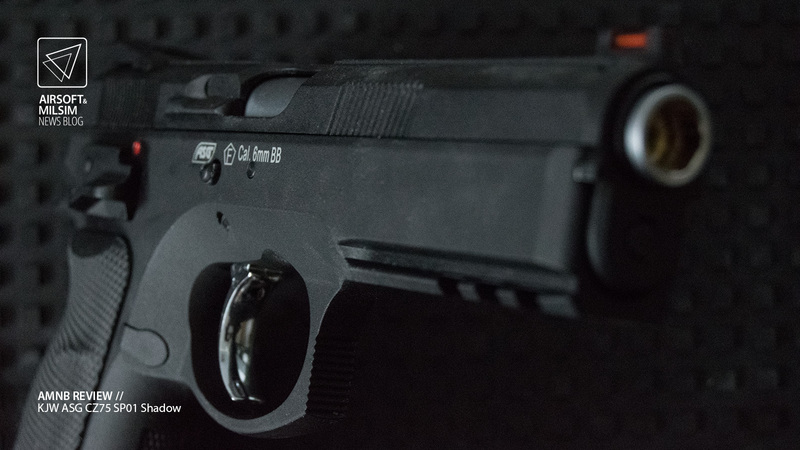 This gun has been modified to have a reduced trigger pull and as always has negated recoil feedback with the use of the low profile slide design. 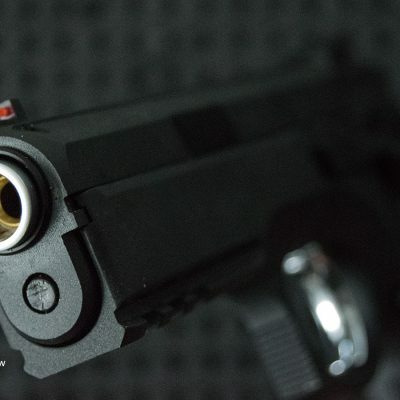 KJ Works has been the first airsoft manufacturer to replicate this pistol as close to the real steel as possible. 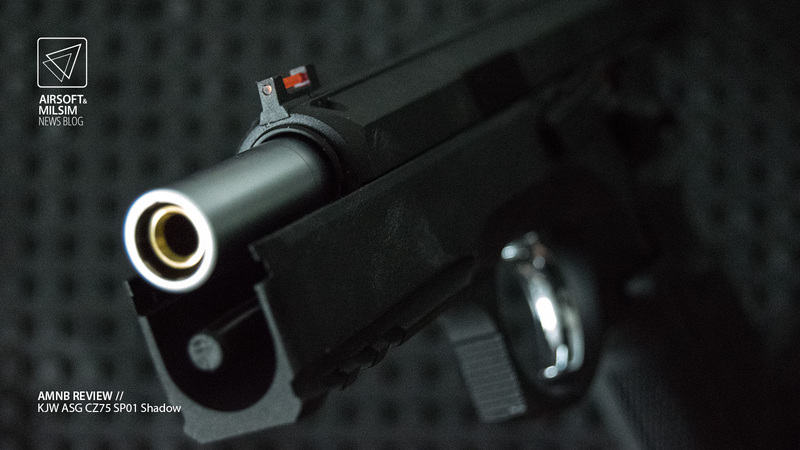 This pistol is focused for use in competition shooting in Airsoft International Pistol Shooting Competitions also known as Action Air Pistol Shooting in the UK. 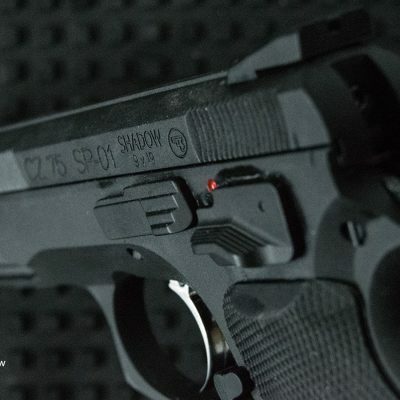 One very special feature of the SP01 Shadow is the fact that even though it has been specially created for competition shooting, it is considered to be a Production Division pistol. 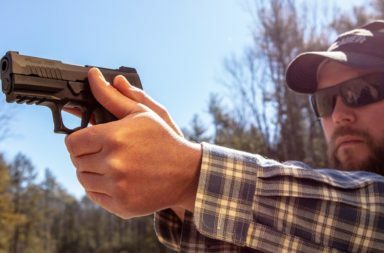 This means that it can be used in a class of competition shooting in which it competes against standard, unmodified pistols. 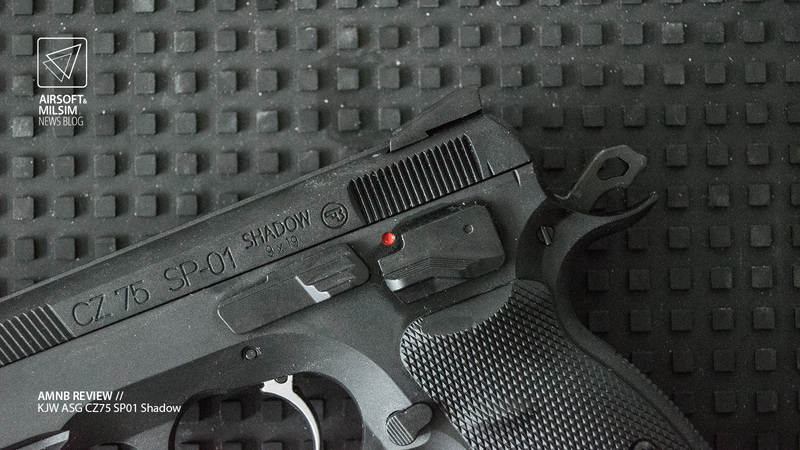 The SP01 Shadow much like the real version, has a functional double action trigger and an ambidextrous safety. 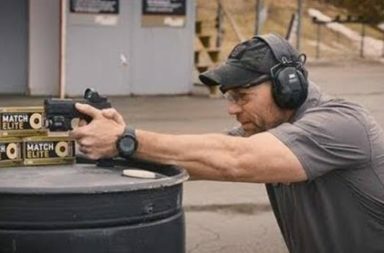 There is no de cocker which means to rest the hammer, the magazine must be ejected and the trigger to be pressed. 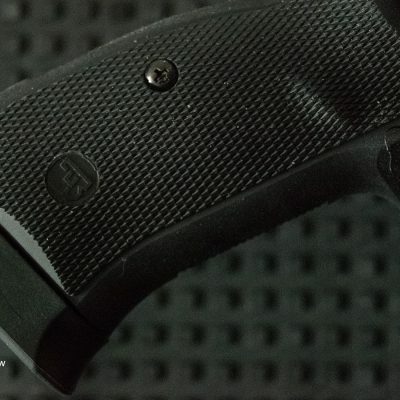 The slide release is not ambidextrous and much like the real thing, acts as the take down pin for the separation of the slide from the grip. 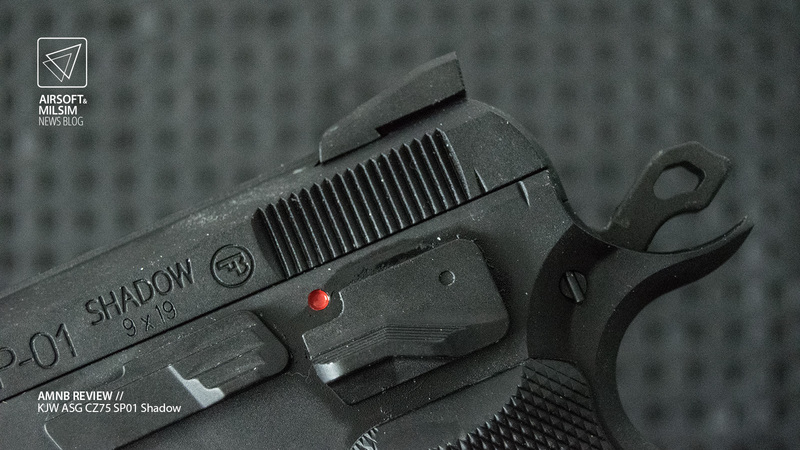 The rear sight post is very simple with a serration in the middle for alignment with the front post. After careful examination, there is evidence to believe that this sight post can be replaced by any real steel after market parts. 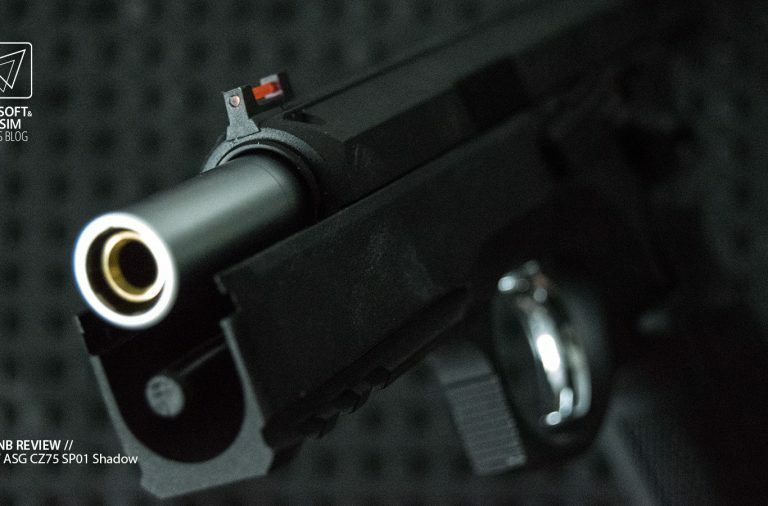 As you may have guessed, the pistol is a gas blow back replica with a low profile slide design. 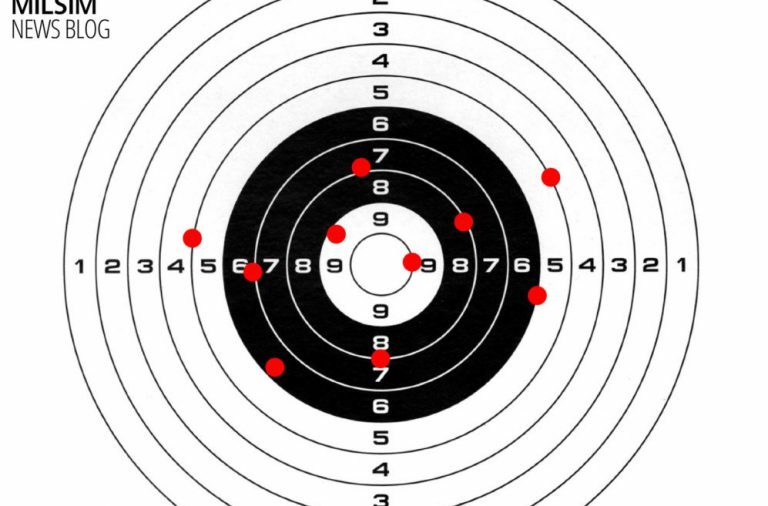 This should mean that the recoil on this replica should be negatable from causing follow up shots to miss the first shot’s trajectory. 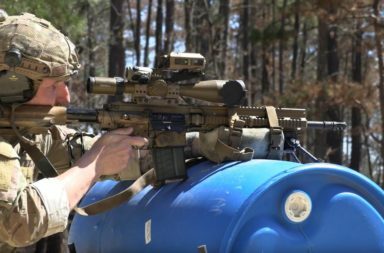 This sounds like an admirable feature in the real steel version, but may not have much of an effect on the airsoft replica due to the amount of recoil available from the propellant. 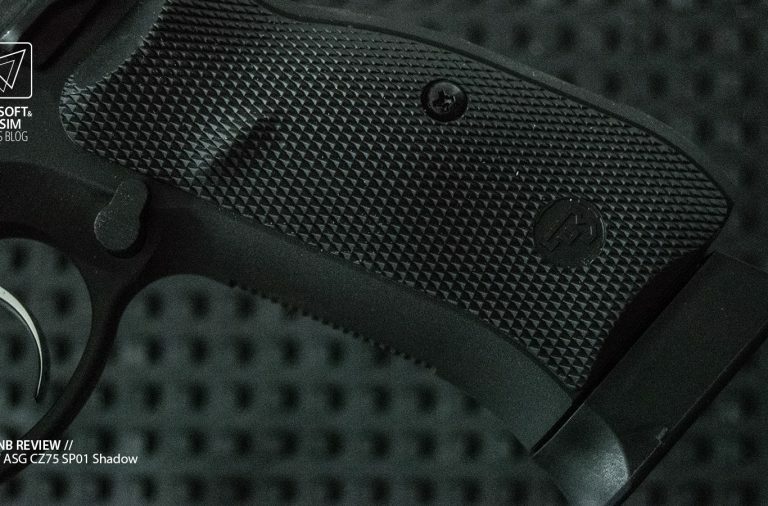 One issue that might be had from the low slide profile is the lack of volume for the hand to grip the slide when attempting to move it. 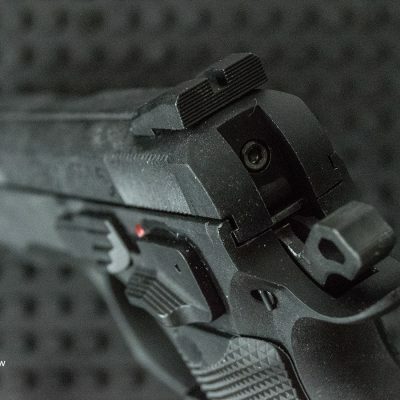 This seems to be compensated in the design of the pistol as it has multiple serrations on the front and the back of the slide to promote grip. This is definitely a limitation that can be circumvented through correct practice of the manipulation of the replica. 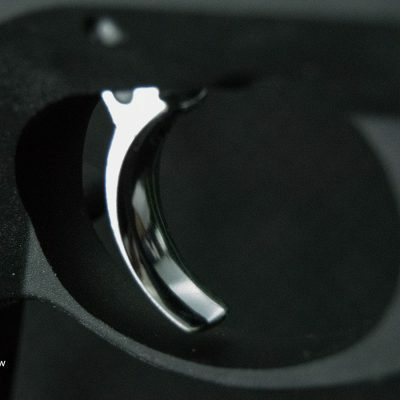 The hammer is skeletonised and the trigger is streamlined to allow for a lighter pull. 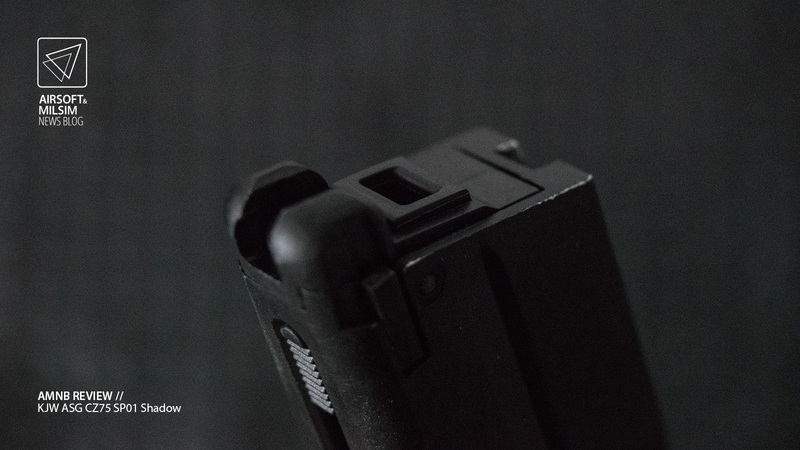 The magazine release is not ambi-dextrous but protrudes out of the grip enough for the user to be able to use it with little difficulty. 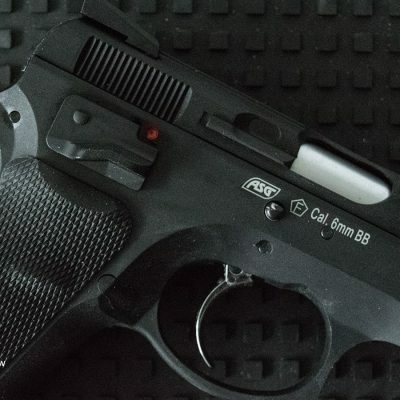 If you are a left handed user, this replica may not be the right pistol for you. The hand grip on the frame is made of rubber which allows for an easy grip, the pattern adds to the effect however is more a visual touch than a functional one. 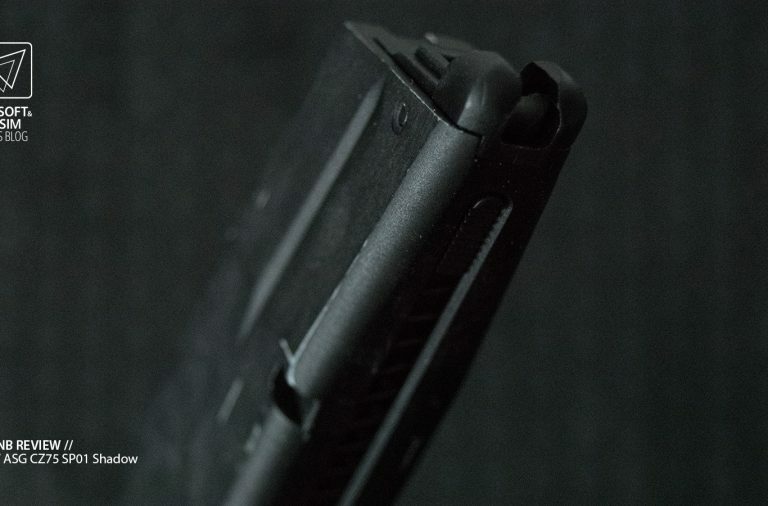 You can see two serrations on the back of the slide. 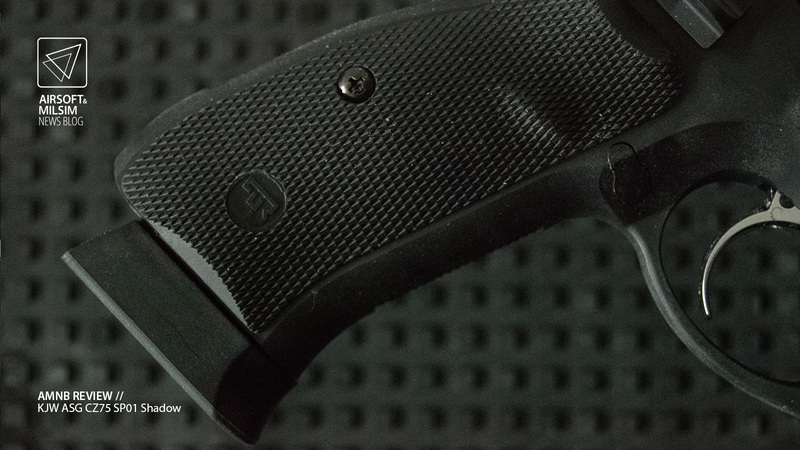 These serrations help the user align the slide with the grip to be able to remove the take down pin from the grip. 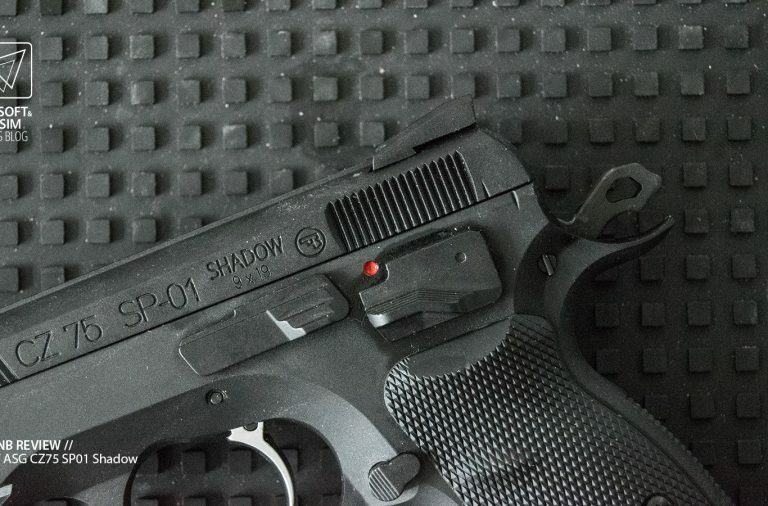 All of these features are inherent from the original SP01 Shadow. 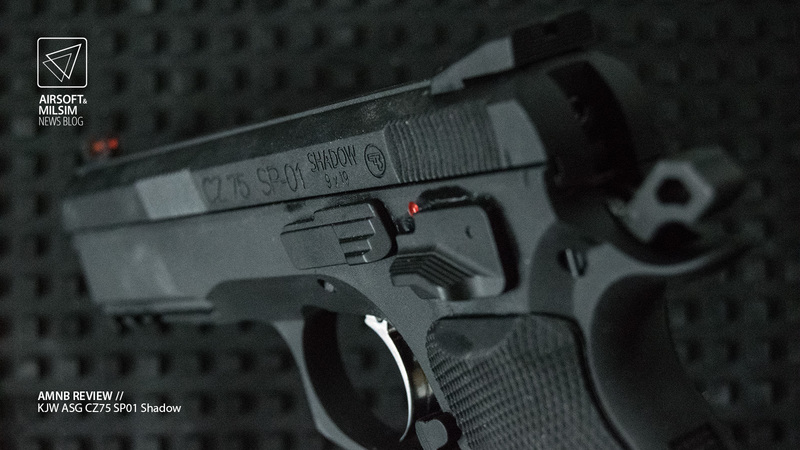 The SP01 Shadow is available with both gas magazines and CO2 magazines. 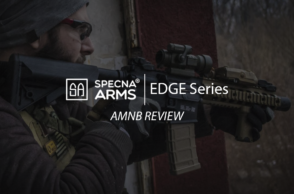 We were unfortunately not able to test the CO2 magazines with this review as the SP01 was only provided with a gas magazine in this specific circumstance. 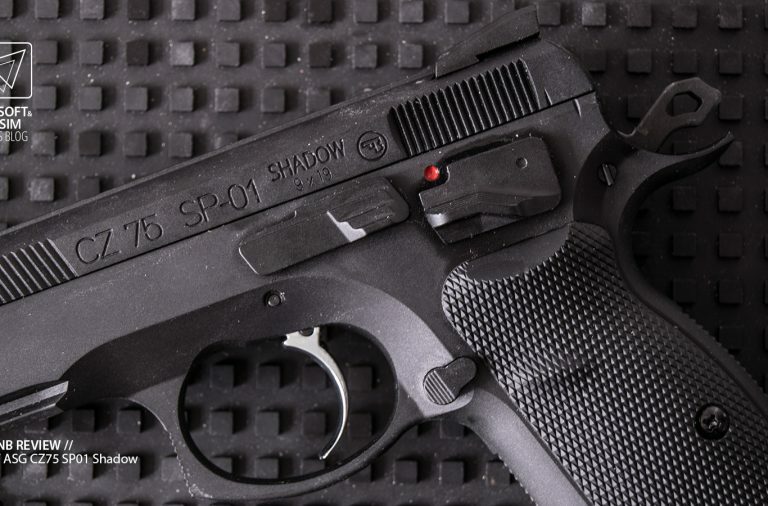 The same magazines that are available for the KJW CZ 75 are cross compatible with that of the SP01 Shadow. 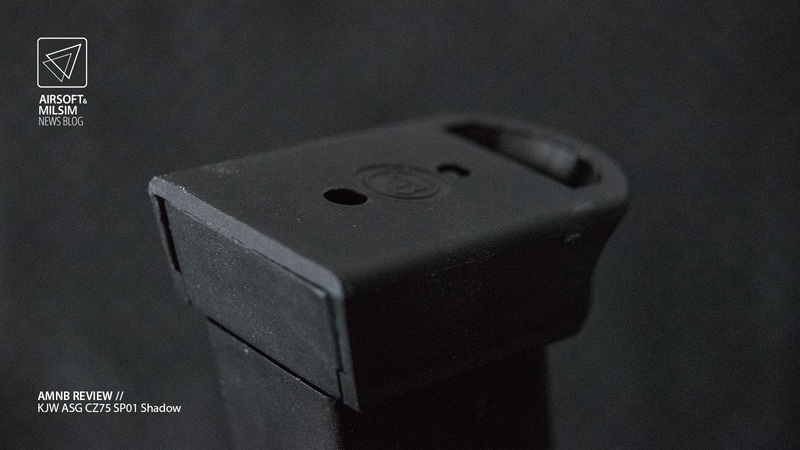 The gas magazine capacity is 26 bbs and comes with an extended base plate which is mostly pot metal with a plastic outer shell. 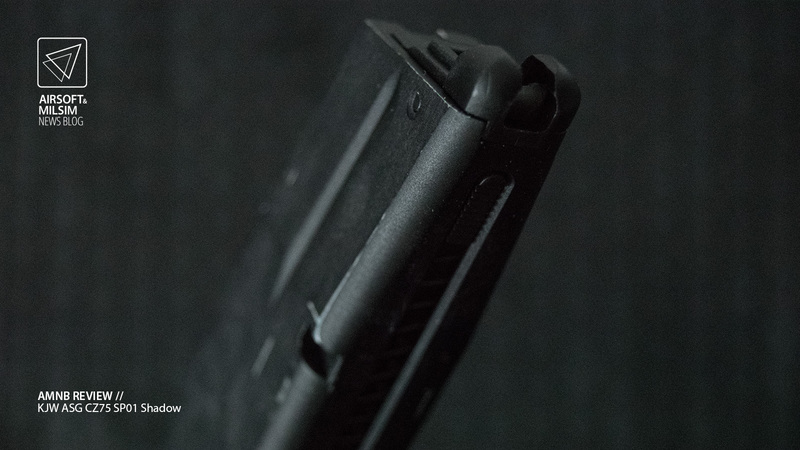 The extension allows for the magazines to fall to the ground with more resistance to damage and to increase the longevity of the magazines themselves. The paintwork on the SP01 replica is not something to be admired. 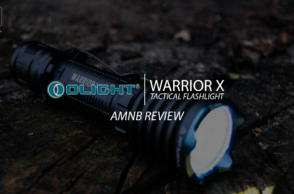 It can chip quite easily with light use and somehow has the ability to make dirt and small specks of dust, stick to it. 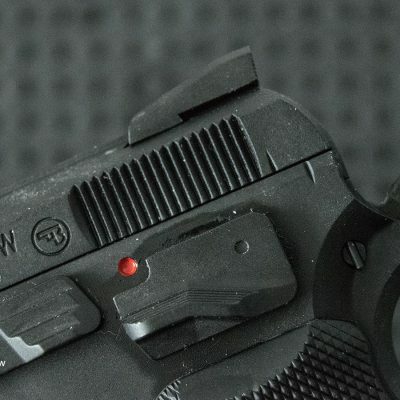 If you are someone who likes to get a worn look out of their pistol, then the paintwork on this replica is ideal for your intentions. A large majority of this replica is made of a metal alloy. 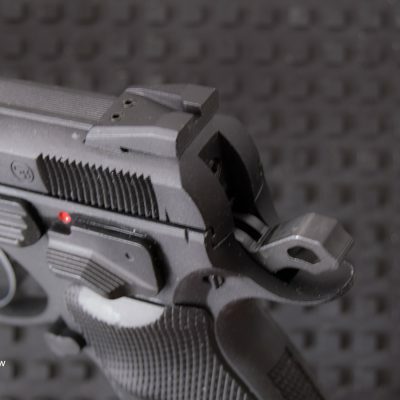 Only small parts including the rubber grips are made of non metallic materials on this gun. Quite a lot of this replica feels like it’s been made out to withstand CO2 or stronger as a propellant. There is not much tolerance available for parts to wiggle on this replica, that can be considered to be a good thing but then only time will tell. The silver outer barrel has not rusted one single bit which seems to be an achievement considering it has been intentionally stored in a humid area to test longevity in storage. 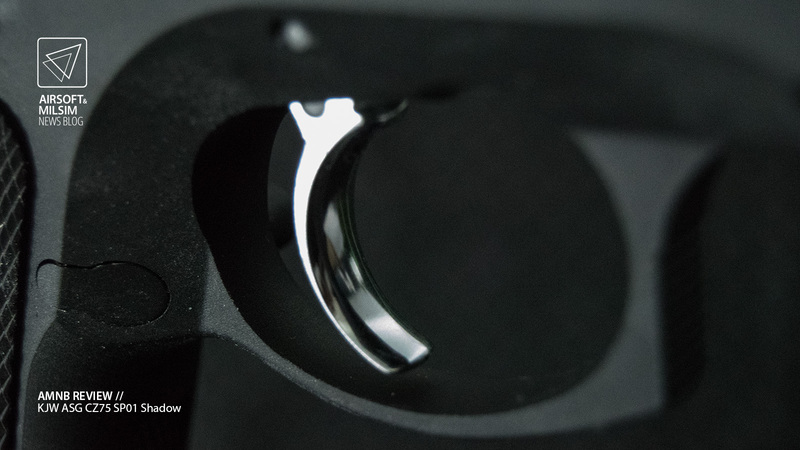 It is hard to say whether it has been anodised or coated in a smooth and anti-oxidant finish. 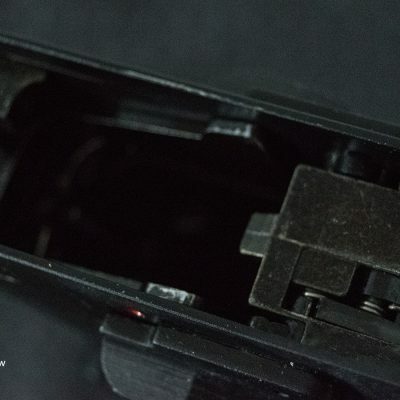 The same can be said for the trigger and all internal mechanisms considering there has been no sign of rust or wearing after prolonged storage. 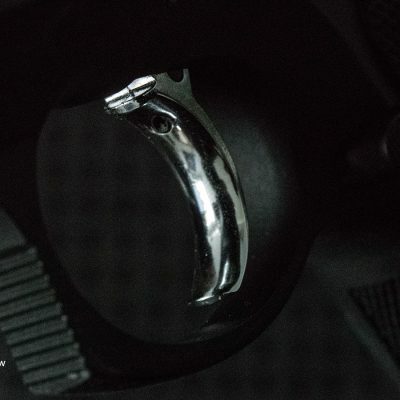 The rear sight post is designed as a top cut peep hole sight with no dots or easy indicators to show where it is in low light. This can be a little bit of a disadvantage in certain scenarios. 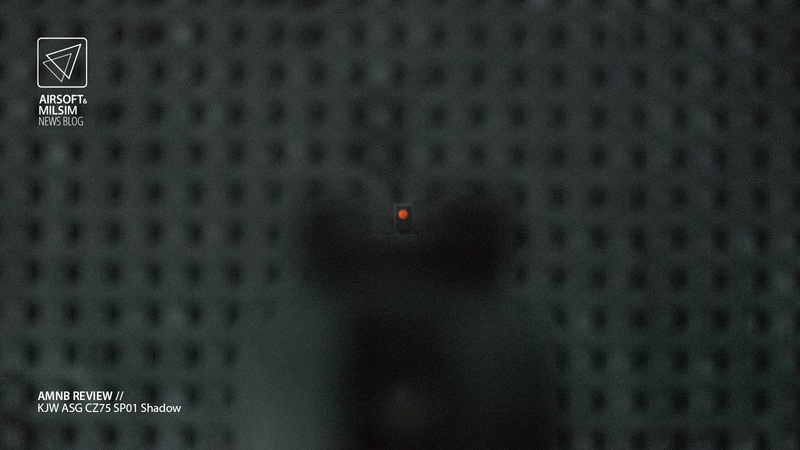 The fibre sight on the front post is a nice addition to a replica that is designed to be used in competitions as it does help target acquisition. 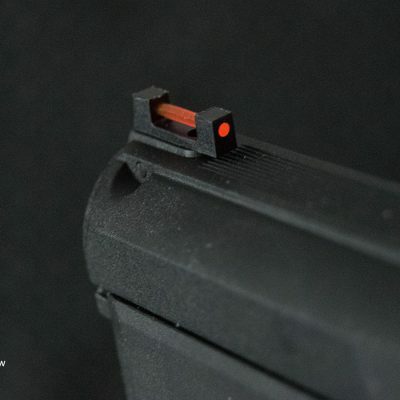 It is a pity that the rear sight post does not share the same design as it would have been ideal. 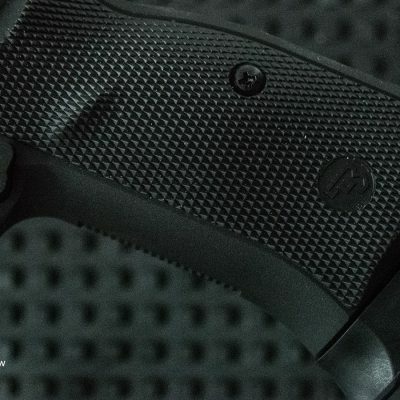 One part of the pistol which really makes this pistol nice is the grips. 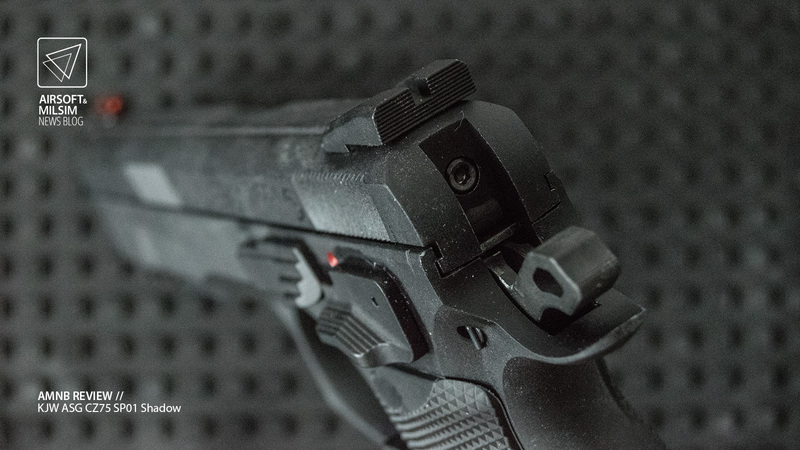 There have been mixed opinions on the grips by different users, however the general consensus has been that the grips are really ergonomic and have an enhanced rubberised grip. 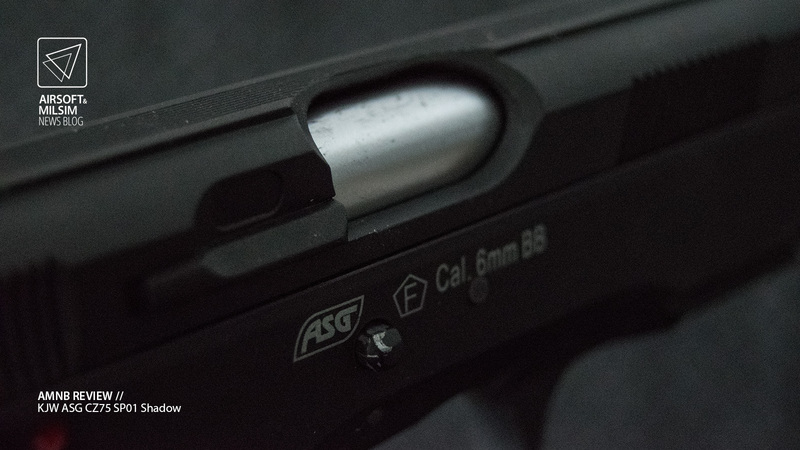 Fortunately if you do not like these grips, ASG are providing other variations of grips in the near future to be sold with the original gun. 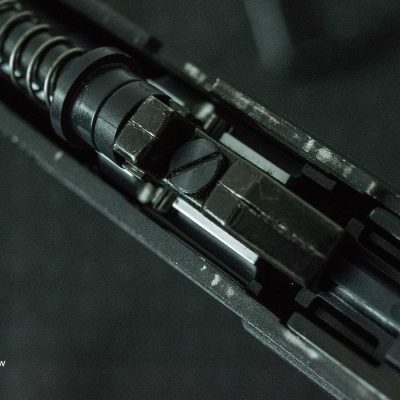 If you’ve seen the videos from IWA in Nuremburg, you may have noticed metal grips and a frame attachment to include a rail for optics over the slide. 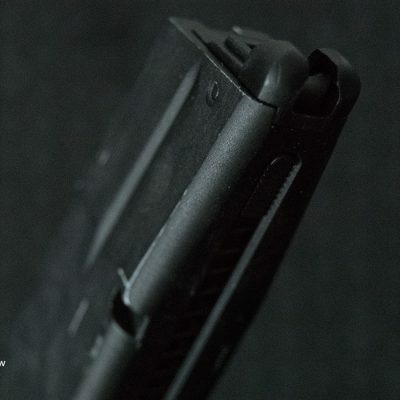 The magazine is primarily metal with a plastic feed lip and plastic base plate. 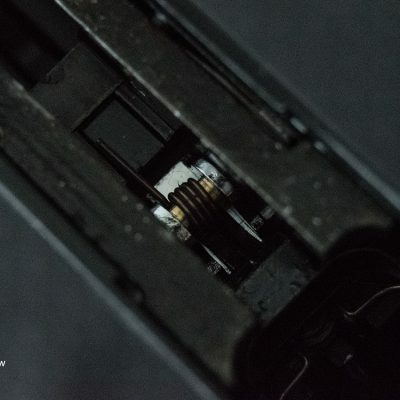 The magazine has been dropped multiple times on the ground as part of testing and has had little structural weaknesses due to the vibrations of the impact to the ground. 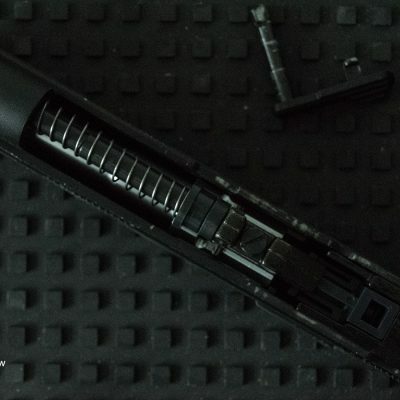 As far as can be seen, these mags are very well made and are built to last as there is yet to be a leak in any of the tested magazines. 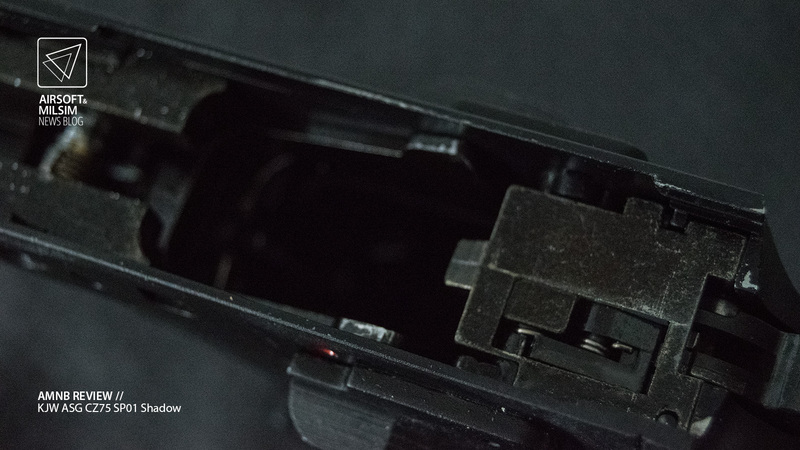 Little can be seen of the internal mechanisms of the trigger groupings. This may actually be a good thing considering there is less of a way for dirt, grit and/or dust to get in and cause problems. 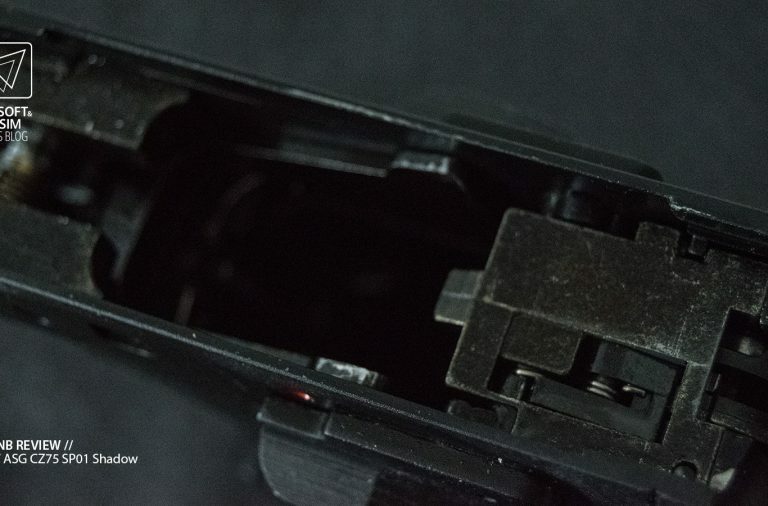 As far as could be told regarding the operation of the hammer, the trigger mechanism has little slack within the moving parts. 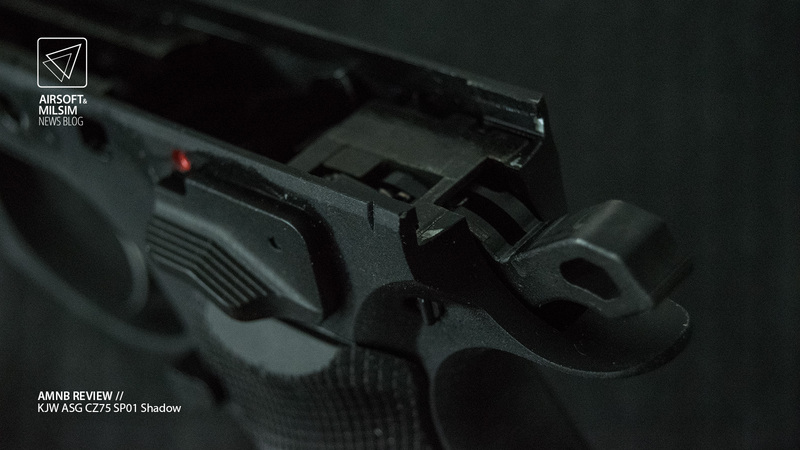 The trigger lever which goes around the mag well of the grip has a lot of wiggle when pulling the trigger. 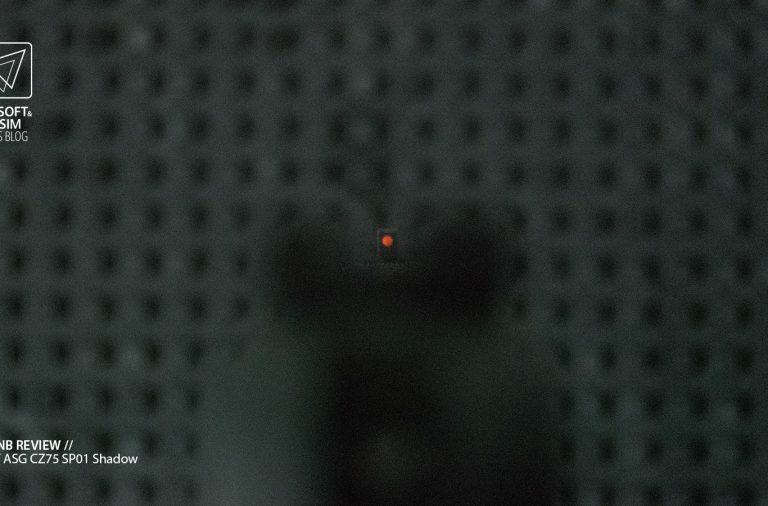 This is not good as it can be felt in the trigger itself. 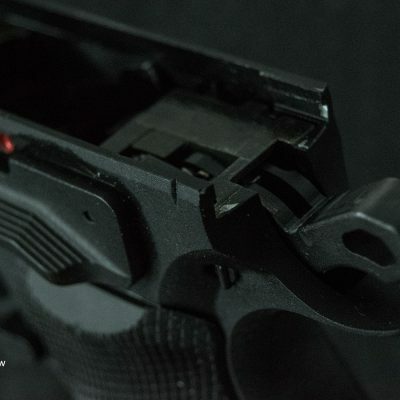 This can also cause issues in the future as it can vary the pressure of the trigger pull depending on where the pressure is being excerted on the trigger. 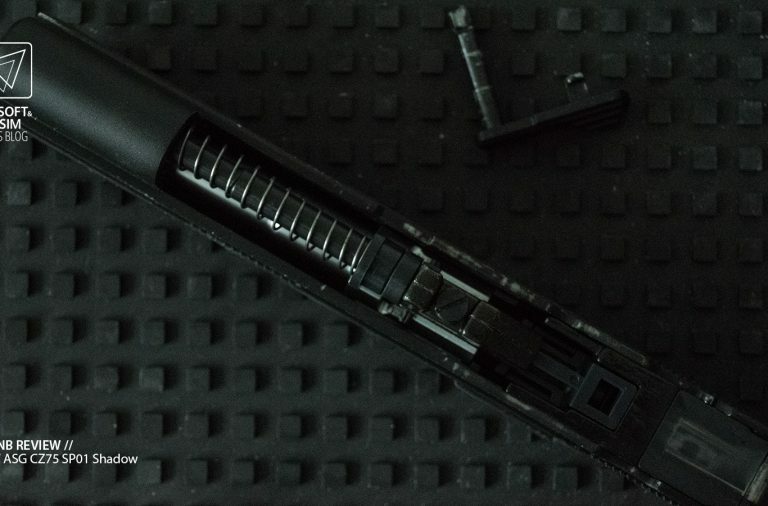 The slide housing the blow back housing, hop up unit, barrel and spring guide comes off by aligning the notches on the slide and frame. This alignment allows for the take down pin also used as the slide catch, to be pushed out of one side and pulled out the other. Once it is free of the frame, the slide can be separated from the frame for hop adjustment and/or further disassembly. The hop up adjustment is a small screw which pushes a lever touching the top of the hop bucking down. 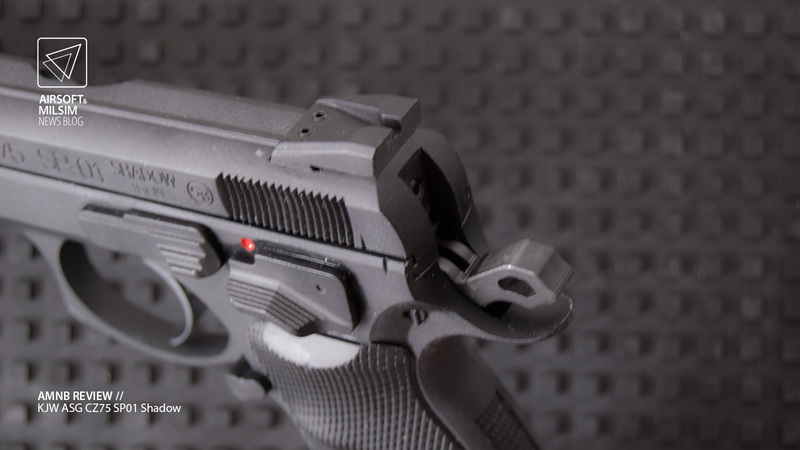 The same adjustment mechanism is found in the KSC CZ P09 which has shown to be an effective form of hop adjustment. 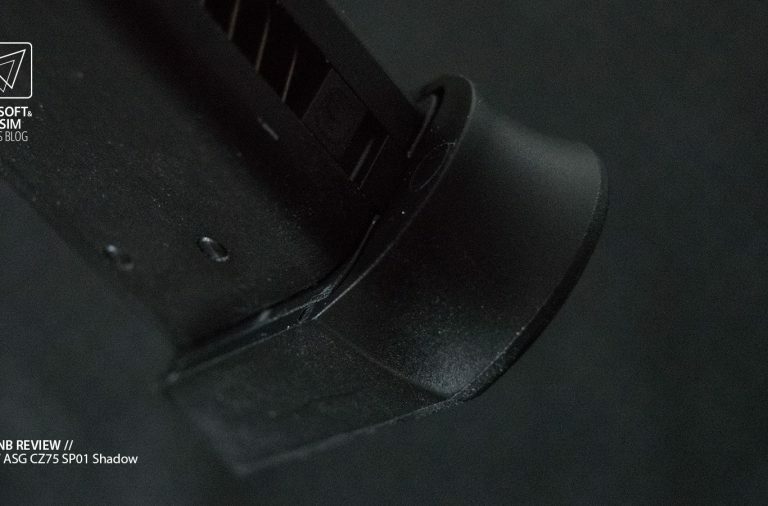 The most interesting part of the slide is the back of the blow back housing. 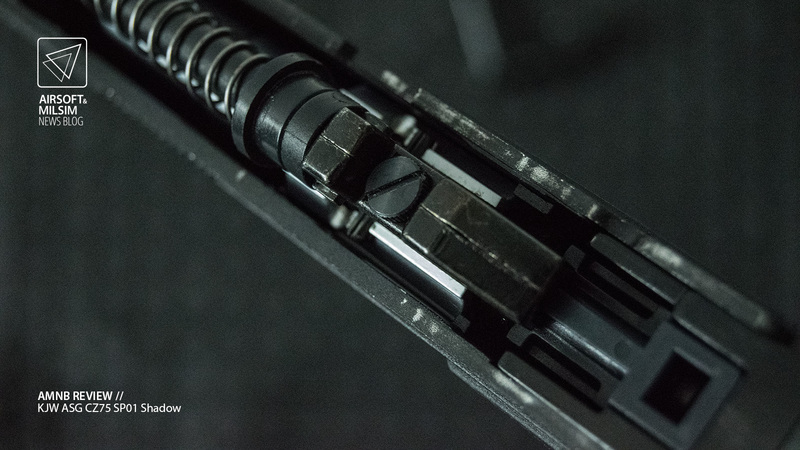 The blow back housing is protected on the back by a smooth metal plate which assists with the travel of the slide along the back and stops any damage from the hammer rubbing against it. This has proven to help against wear on the housing and stop the hammer from catching against anything that it shouldn’t be. 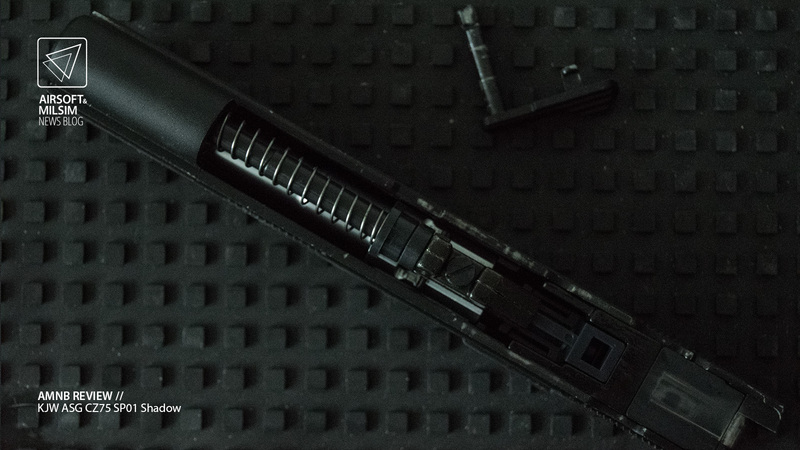 The recoil spring on the slide is very strong as it is meant to be able to handle C02 propellant. 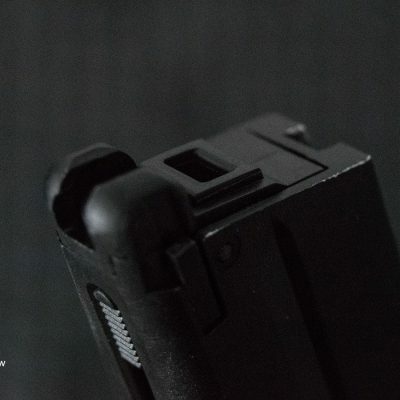 It also seems to be compressed slightly by a stopper to help with not only a small amount of short stroking but also the impact of the front of the slide to the end of the spring guide. 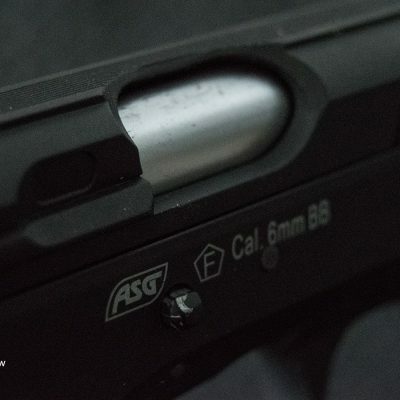 The inner barrel seems to be a 6.05 mm bore at just under 115 mm in length. 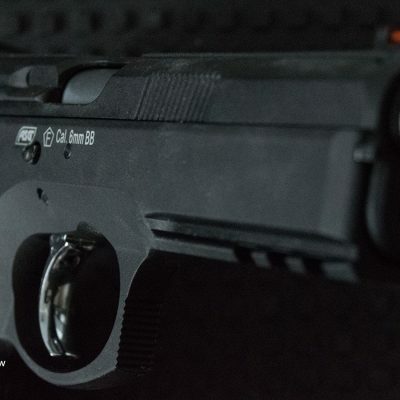 Other than that, there doesn’t seem to be anything special regarding the internals of the pistol compared to other pistols. The blow back nozzle is plastic and everything else including the hop up housing is of metal composition. If you think it’s going well so far in this review and want it to stay this way, then please stop reading. 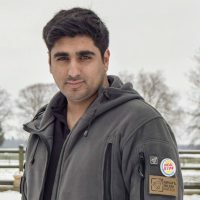 The most important part of a review is the performance of the product. 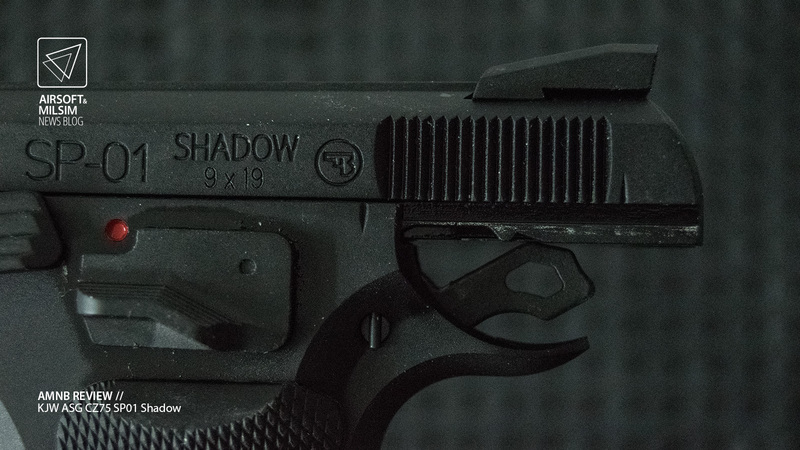 Unfortunately this is were the SP01 Shadow fails to be a good product. 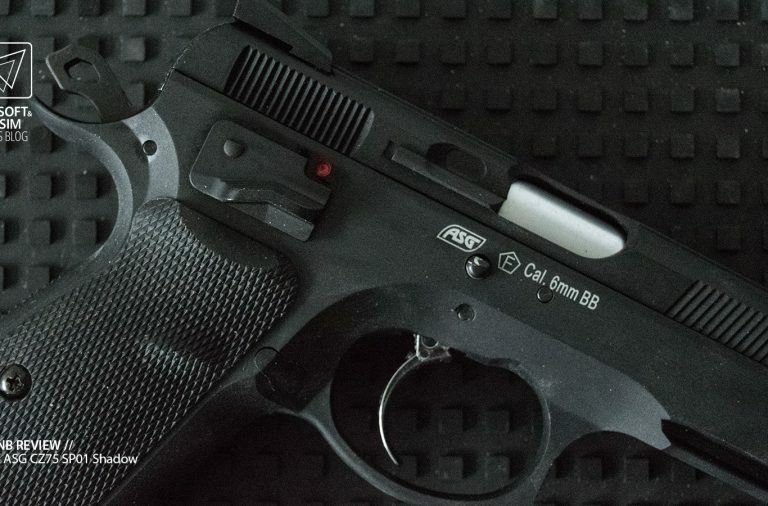 When first using the SP01, the replica did not cycle properly using green gas or equivalent. 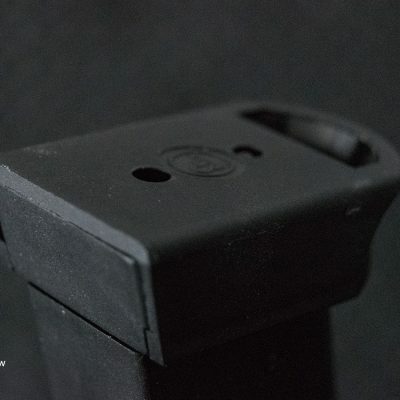 We were not able to test the C02 magazines due to them not being available with the pistol in this package. 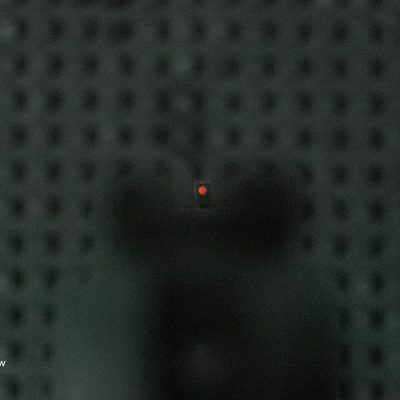 I am sure that the C02 magazine would have assisted in the break in period of the pistol. 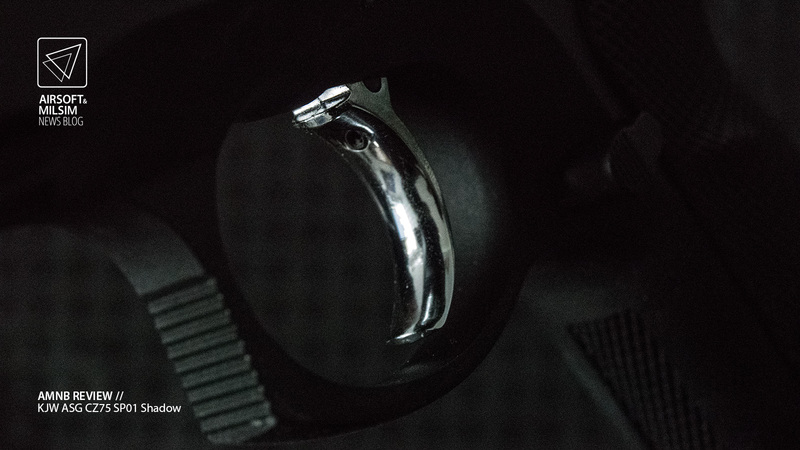 Having said this, the pistol took over a thousand actions for the cycling of the pistol to feel more fluid and consistent. 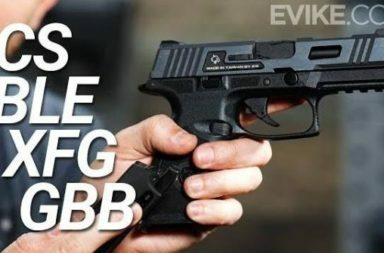 This is an absurd amount of time for a pistol to break in, especially one like this. 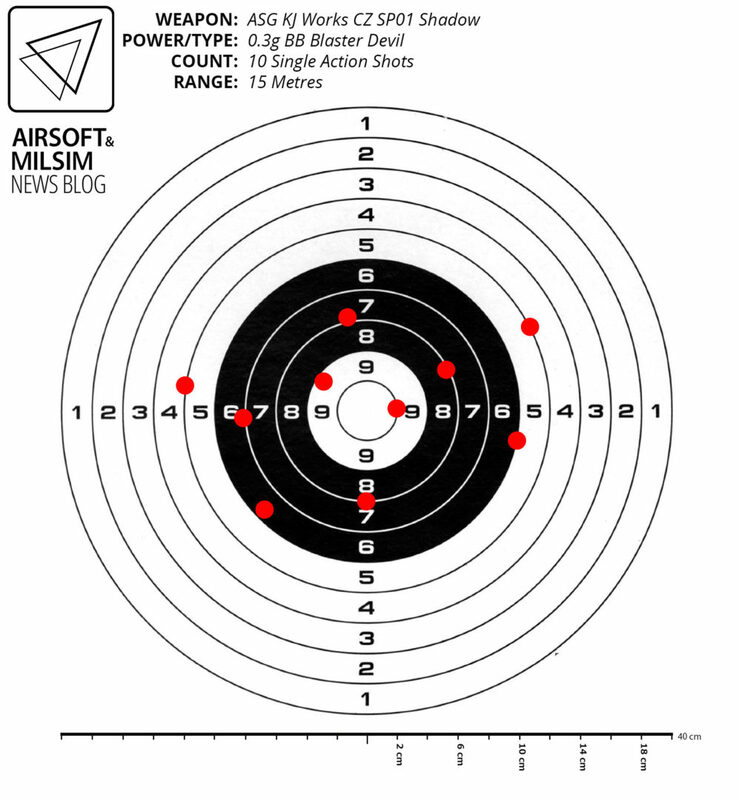 The target shooting was quite inaccurate at range. 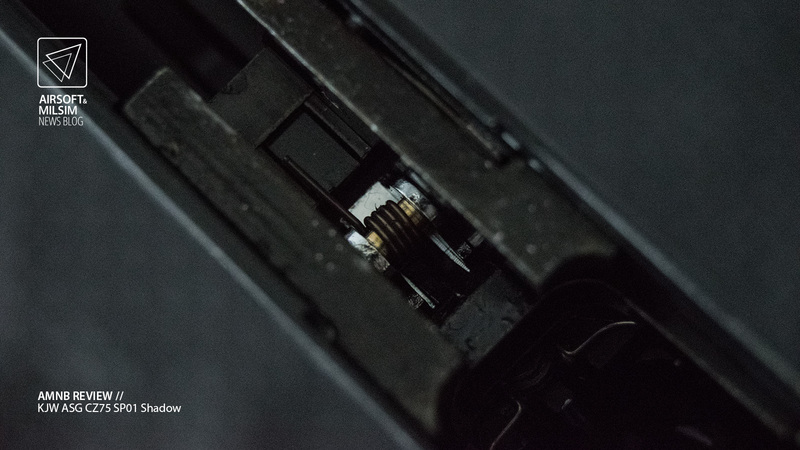 All our tests are done with all internals being cleaned and thoroughly worked into to ensure the test is performed in the best conditions for the product in question. It is amusing how there is more of a horizontal spread compared to a vertical spread. 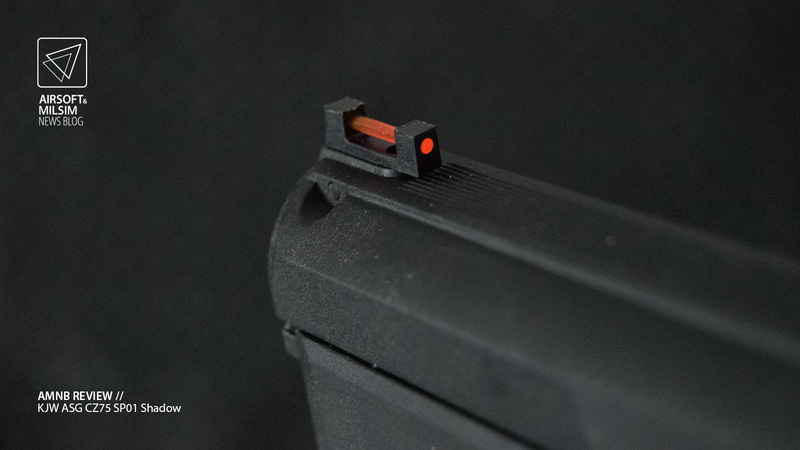 This shows that it is likely that the inner barrel and/or the recoil of the slide action is causing the inconsistency compared to the hop bucking and any tolerance issues in the hop unit housing. 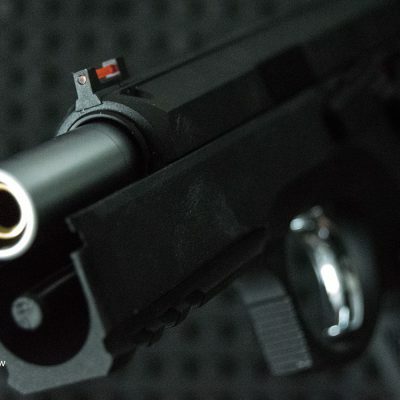 I would be resolved to say that the replica is still a good competitor in Production division shooting competitions considering these competitions do not allow any modifications or upgrades to be performed on said gun. Unfortunately after two months of testing and over three thousand actions, the double action trigger failed to operate properly and would not engage the knocker valve properly. This basically means that the gun has failed to operate as intended after a few thousand cycles of the slide. 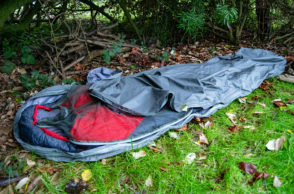 One’s first thought would be to assume that this has only happened with the review product and is due to a defect. 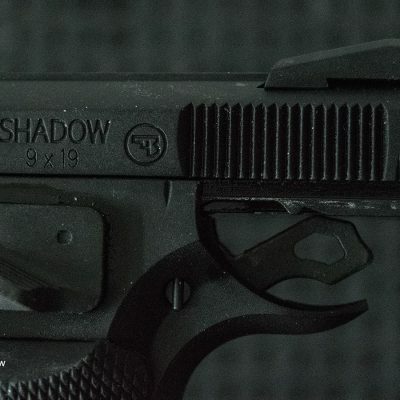 Unfortunately many users of the SP01 Shadow have shown the same issues. 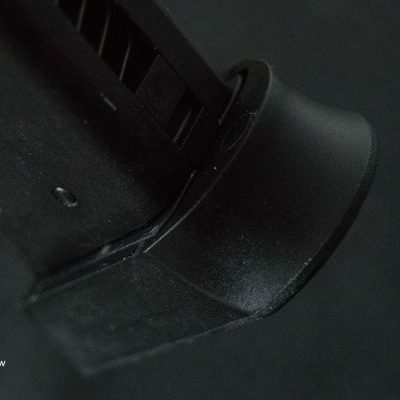 After further investigation to the replica, it has shown that the hammer is not pulled all the way down when the double action is used, this stops the knocker pin from recessing all the way back and then returning to hit the knocker valve of the magazine. 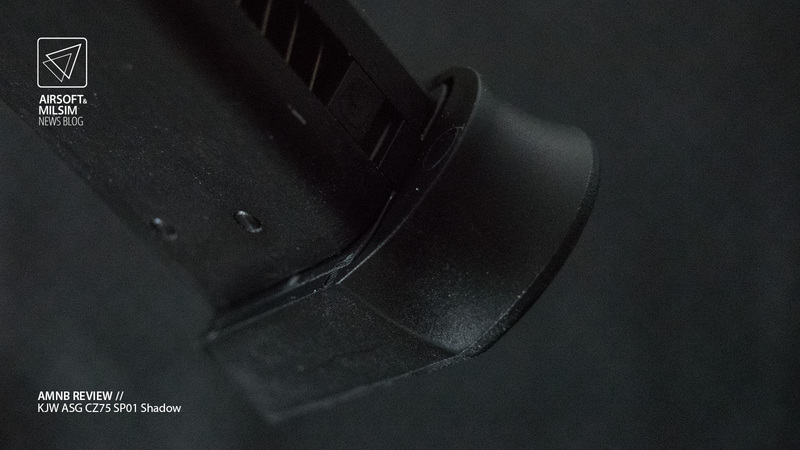 Instead it only moves a little and doesn’t apply enough force to even release any gas from the magazine. 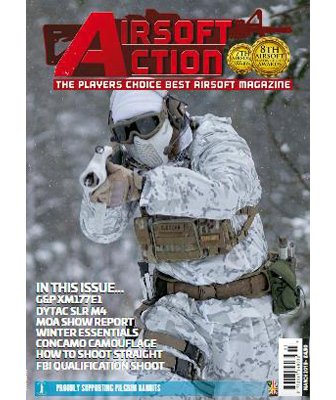 If you enjoy only using this replica in standard competitions and don’t expect to use the double action then this issue will have no effect on your use of the gun. 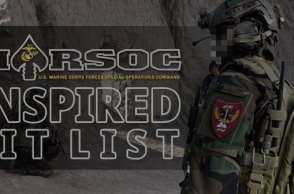 It is recommended however that you use a very strong gas that can compete with C02 propellant or just use the C02 capsule gas magazines. 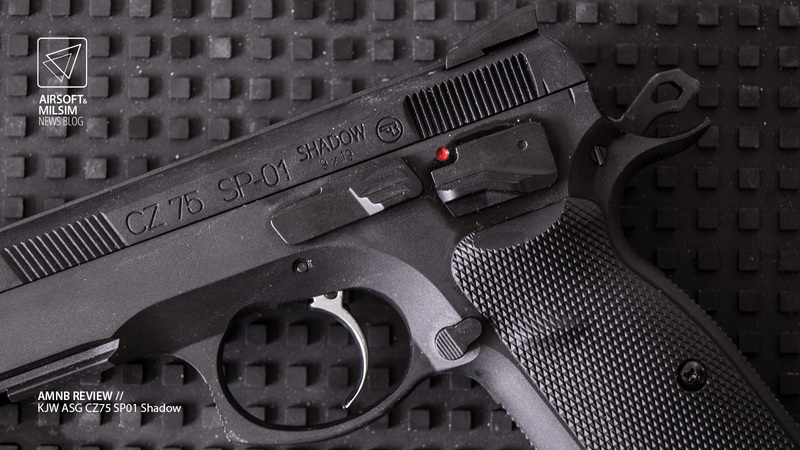 To sum up the ASG Licensed KJW CZ 75 SP01 Shadow, this replica is a nice pistol for use in airsoft games and any non competitive events. The pistol is still quite sluggish compared to other pistols when it comes to the action of the slide. 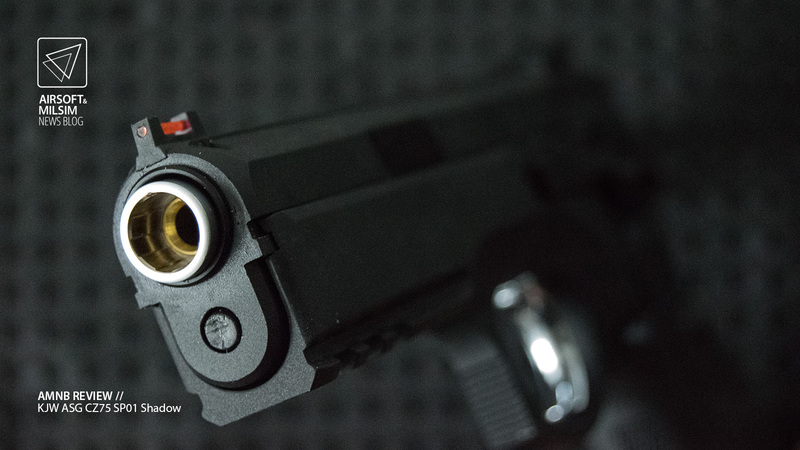 The ergonomics of the pistol and how it would operate as a real firearm are by far one of the nicest pistols I have ever handled. 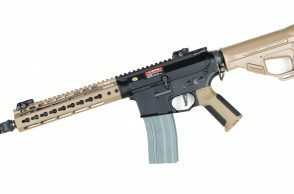 Here is me now wishing for another airsoft manufacturer to have a go at replicating this pistol. 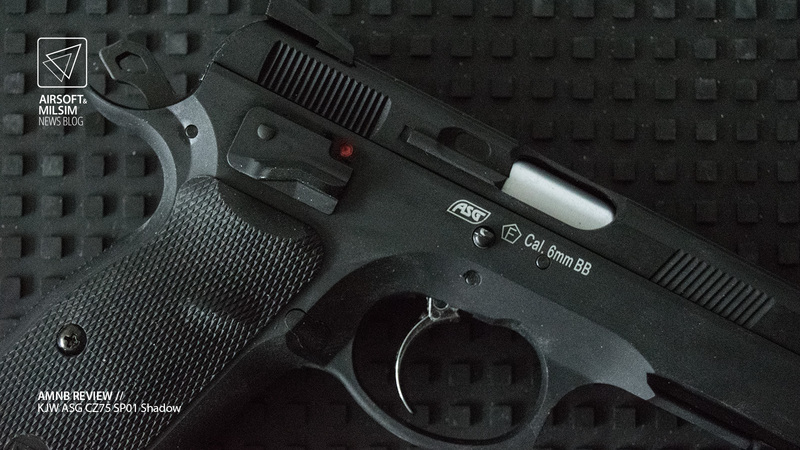 Don’t expect this to be the perfect pistol out of the box, it lacks efficiency and consistency. 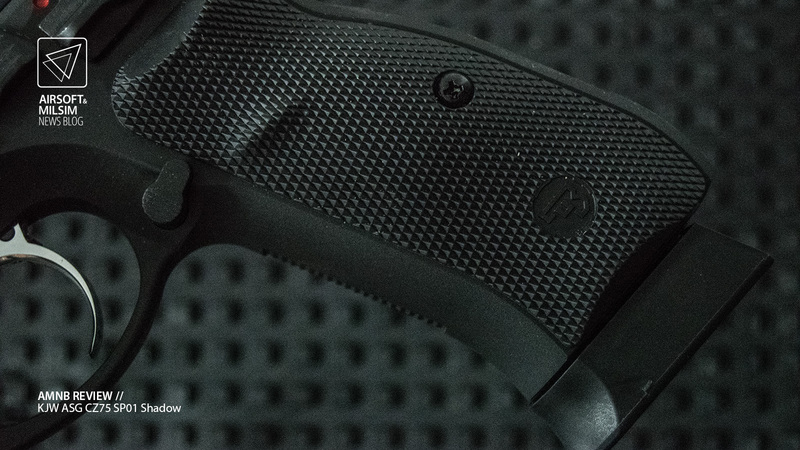 This pistol is overall a very good pistol after it has had the rough edges and defects smoothed out. There is nothing like entering a competition and finding that your score has been effected badly more by your tools than your actual ability. 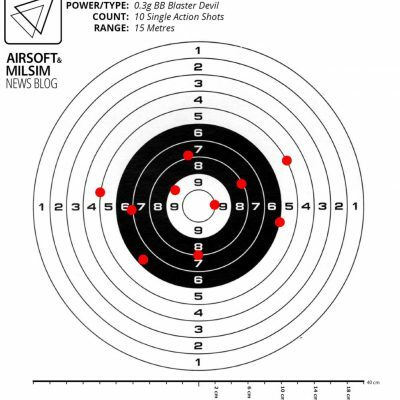 This is what it feels every time I use this pistol in training, and hence would not be recommended in any form of competitive use in AIPSC.